Am I a pet person? I know that might seem like a weird question. I mean, if you have a pet, then you are obviously a pet person, right? For example, when I was a kid, we had a dog that was a cross between a German Sheppard and a Great Dane…he was the size of a Great Dane and looked like a German Sheppard. Needless to say, solicitors NEVER came to our door. But, because my parents came to Canada from Italy (and, I’m sure I’ll have a lot of people who don’t understand, but I’m sure many Italians of immigrant parents WILL understand), we weren’t allowed to keep him inside. We lived on some property and there was a small horse barn left from the previous owners, so our dog lived in there and was free to roam as he pleased. I think he was happy, but I wouldn’t say he was our family dog because we didn’t interact with him the way other pet owners interacted with their pets. I think he belong to the neighbourhood. Fast forward to today, where I am an adult (by virtue of my age but not my maturity ;)) with my own kids. I never thought of getting a pet for my kids (aside from the occasional fish or bird), partly because we were always on the road with sports and it just didn’t fit our lives. But, I also didn’t have that “pet void” where, because I had pets as a child, I felt I needed to fill it. However, the home where we live now was built on farmland, where mice inevitability “visit” you inside. Soooo, we ended up with two cats. Ari is our first cat. Let me begin this by telling you neither my hubby or I thought we were cat people. But, when a friend of mine told us there was a feral cat in her neighbourhood who kept having kittens and she needed someone to take one, I obliged…but I obliged by saying “I’ll try to sell this to my hubby, but I think I’ll be bringing her back Monday”. Long story short, she stayed. She’s our “I’ll find that critter in 3 minutes flat” mouse hunter and, even though she looks miserable in EVERY SINGLE PICTURE, she’s pretty awesome. Now, you’d think a family with two cats would REALLY be done with pets, but last year, my oldest son (who had moved out the year before) was visiting the Toronto Humane Society and said “mom, you need to come down here and get this dog”. I told him we were done with pets but, to appease him, we all went down. We were told everything there was to know about Benny before we met him…you know, all the normal things…like he was adopted twice and brought back, that he had behavioral issues and that he had 8 bites on record. You know, normal stuff. I said, “Are you crazy Daniel? Why would I want this dog?” Then the girls from the Humane Society asked, “Do you want to meet Benny?” I said sure, but still had no intention of bringing this beast home. Well, when we met him, it wasn’t “Wow, he’s the sweetest!”. It was more like “God he looks like a wolf!”. But, just then, two other pups came out and we all looked away from Benny and looked at the cute pups and said “omg, adorbable!!”. The more I thought about it, the more I realized Benny would never be adopted because everyone who came to meet Benny would inevitably leave with an “OMG adorable” puppy. He was like the chubby little kid who is always the last to be picked for the team. He had been there for a year and I think we were sent there to bring him home. HE. IS. THE. MOST. AWESOME. DOG. EVER!!!!!!!!!!!!!!!!!!!!!!!!!! Soooo, you’re wondering what this has to do with food? Well, Benny is like my new baby (my husband jokes that every day when he comes home from work, I say “You’re not gonna believe what Benny did today! !”) and, like any mom, feeding my new baby is a key part of nurturing them into adulthood. Yes, I buy dog food (although I’ve been known – often – to cook up some meat and sneak it to him!). But, treats are different. I have the usual “crack treats” like those marrow bone thingies but I’ve always wanted to make a healthier snack for him. I’m still learning (I knew that chocolate was bad, but I didn’t know onions were bad and that I shouldn’t give him bananas). I made these biscuits for him and he loves them…I’ve even given them away to friend who have dogs! I found a cute bone cookie cutter at the bulk store so they look cute as well as tasting yummy! If you want to see more of Benny’s shenanigans, I also adopted his Instagram account when we brought him home…we document all his cuteness here! 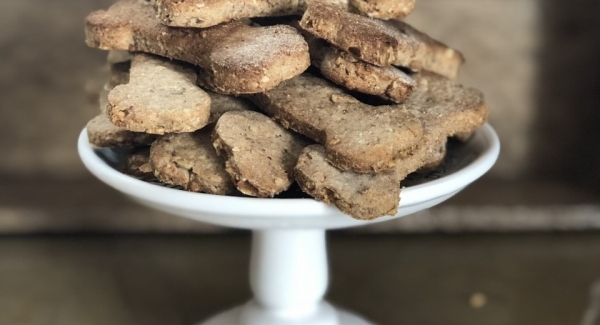 Make your dog some treats! It’s the least you can do for his unwavering support and all the loving slobber any human can take!! The Best Dog Biscuits ever!! Ever though about making a treat for your best buddy? I mean the one that greets you at the door and loves you unconditionally? Yup, I mean that furry fellow! Whip up a batch of these treats and he will love you eve more...if that's possible! In a large bowl, mix flour, oats, flax, psyllium husks (if using), sunflower seeds, and peanut butter (mix with your hands for best results). Add in melted oil, fat, honey and water; mix well, kneading on a well floured counter top to get the dough to come together (about 5 minutes); using more flour, roll out the dough to about 1/3" thick. Using a bone shaped cookie cutter (or whatever shape you like...you can even just cut them into small rectangles like the size of a cracker) and place on a parchment or Silpat lined baking sheet. Bake for 20 minutes or until the bottoms are golden (you can bake them more if you like...I'm sure your friend won't mind!). Keep up the blogs love them all and adore you so. Thanks so much Maria!! I never knew how much my pets would mean to me!! They’re such good company! Hi Suzie! I will definitely make these for my 2 dogs. Just a PSA though for your readers. Some peanut butter has xylitol in it and it is deadly to dogs. So make sure when you make these or stuff a kong with peanut butter that you read the ingredient list to make sure your brand doesn’t have this in it. Oh Cindy!! Thank you so much for that tidbit of information! I only use natural peanut butter but I make a note of that in the recipe…I will add that in!! Thanks so much for all of your wisdom!! On another topic – I just discovered your “Bake It Forward” and would love to further the movement. On to the info so I can join in this worthy effort! Oh my goodness Pamela!! You are a star!! I love finding out that other people will rescue dogs…there are so many of them that need homes!! Thanks so much for the info…I will definitely pass it on!! And thank you so much for asking about Bake it Forward!! I would love for you to join the movement!!! !